Nicole's Needlework: Stitching at Amy's! I got a fat 1/2 of 40 ct. Light Examplar by Lakeside Linens (I just couldn't resist it)! I'm such a sucker for LL linens, especially in such a pretty color! I also got the newest LHN "Colonial Women" and BBD "The Simple Things" along with some threads and my favorite needles. Lastly, I got the one LHN Saltbox thread pack that I was missing. I want to stitch all four on one piece of fabric. I decided to start it yesterday while I was at Amy's. I'm stitching it on the 40 ct. Light Examplar linen I got. I'm really loving it so far! :) Well, nothing else going on here. Looking forward to the end of the school year at the end of this week. We will probably be going down to Florida next week if Matthew is feeling better (he caught a bad cold, but I think is on the mend). Well, going to get back to stitching! Write soon! Lovely new stash and a very pretty new start! 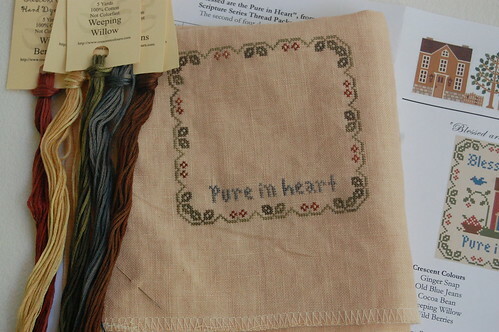 Lovely new things, can't wait to see your stitch these! I love that you are doing the Seasonal saltboxes on the 40 ct, it is ever so cute, on the higher count! What a fun day you had!!! 40 ct. Light Examplar has to be one of my favorites, I can truly understand why you had to buy it!!! LHS Saltboxes are going to look lovely on the Lt. Examplar! What a great idea, to stitch those saltbox samplers on one piece of fabric and such lovely fabric it is. I don't know how you stitch and visit--I just can't do both at once. Great looking stash, enjoy your Sunday. Hope Matthew feels much better tomorrow. MMMMMM... great stash, Nicole. I also LOVE lakeside linens. Great start on the LHN threadpacks; they'll look great all together. 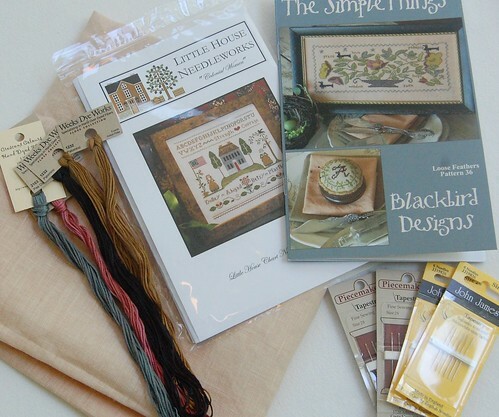 Each time I read your blog, I can't help but notice the similarity of our taste in stitching projects/supplies. I just bought a 1/2 yard of Lakeside Linens 40-count Exemplar, a little darker than the Light Examplar but otherwise the same. I LOVE this fabric and will definitely buy more. Great stash and great start too! Hope Matthew is feeling better. Very pretty start...that should be a quick stitch. Your new stash is so pretty, so is the new start! oh, you got some great new goodies! Wonderful stash buy, Nicole! I can feel your enjoyment. :) I like your new start. Stitching them on the same piece of fabric will be so appealing. Great new stash and new start! i share your addiction (linen addicts - aren't we??)! sometimes i think "this linen is so pretty, i can't possibly stitch on this!" and my husband can't understand me. lol. Lovely stash. I've been wondering about getting the new BBD so if YOU like it, I probably would too.What do you think? hmmm. A wonderful stash, indeed. :D and your new start looks lovely. Visiting your blog always gets me pumped to get stitching. I'm so happy you have stitching friends up there to enjoy time with, Nicole! :) Makes me smile. PS: Love your new idea and start on the LHN and the BBD is awesome, too. Wonderful new stash!!! Your stitching progress is looking fantastic! Lovely design! Great stash, Nicole. What a fabulous idea to stitch all four on one piece of linen. Can't wait to see more.